Just as you should brush your teeth and get adequate rest every day, practicing yoga should be a non-negotiable element of your daily life. Even if you only step onto your mat for 10 minutes and perform a few poses, the magic of yoga truly starts to unfold when you commit to a daily practice. There are so many styles and ways to practice yoga, when you put them all together for a daily practice you will truly begin to see some drastic changes in your physical health, mental health, spiritual development, and social wellbeing. Additionally, having a daily yoga practice can help you strengthen your muscles in focus and discipline; which comes in very handy in a world full of scatter-brained technology and advertisements. The following 15 benefits will come alive in your life once you commit to a daily yoga practice. One of the obvious benefits of practicing yoga in general is increased flexibility. Just think about how much your flexibility improves when practicing one or two times per week, and then think about what the results would be if you began stretching every single day. When you practice yoga every day, you actually have the time to stretch more deeply and target areas specifically. If you’re only practicing a few days per week, you might need to focus on more general full-body sequences. The reasoning is really simple, the more you practice yoga, the more flexible you will become over time. Keep in mind flexibility is for a lot more than just showing off too – when you’re more flexible, your muscles and joints become more fluid. According to this article from Livestrong, a daily yoga practice may also prevent and reverse bone loss due to osteoporosis. The key to building strength with your yoga practice is repetition. Whether you practice yoga at home or in a studio, you likely know that yoga is not an easy workout! Even simple Sun Salutations can build strength in your core, arms, back muscles, and leg muscles. Additionally, yoga offers special benefits because it lengthens and strengthens your muscles at the same time, providing you with long, lean muscles. And unless you’re using props, yoga requires minimal equipment to build strength; all you need is your own bodyweight! This type of strength building is known as isometric conditioning and it tones the entire body rather than targeting one muscle group at a time. If you’re one of the many people that hates getting sick in the winter, take extra care to spend time on your yoga mat every day! Nothing boosts your immune system quite like a daily yoga session, no matter the length. In fact, according to this article from Yoga Journal, “Yoga helps lower stress hormones that compromise the immune system, while also conditioning the lungs and respiratory tract, stimulating the lymphatic system to oust toxins from the body, and bringing oxygenated blood to the various organs to ensure their optimal function.” And bonus points if you conclude your daily yoga practice with a meditation. The same article states that just 20 minutes of meditation can dramatically reduce the incidence of getting ill by lowering cortisol levels, increasing endorphins, and fostering a healthy state of mind. Who knew avoiding the sniffles could be that easy? Have you ever left a yoga class and felt like you were floating on a cloud? If you’ve been in that post-yoga glow state before, just imagine feeling that way for just a few minutes every day. That sense of calmness and non-judgmental observation is known as mindfulness, and it gets easier to achieve every time you practice yoga. As described by mindfulness teacher Thich Nhat Hanh, “Mindfulness helps you go home to the present. And every time you go there and recognize a condition of happiness that you have, happiness comes.” In other words, think of your yoga practice as a daily reminder of your happy place. The more often you step on your mat and visit that place, the more happiness and joy you will experience in your life. One undeniable benefit of daily yoga practice is how it improves your posture and spinal health in general. Your spinal column isn’t just a straight stack of bones. There are fluids and nerves that flow along your spine to and from your brain, and many muscles surrounding the spine that help support your body. 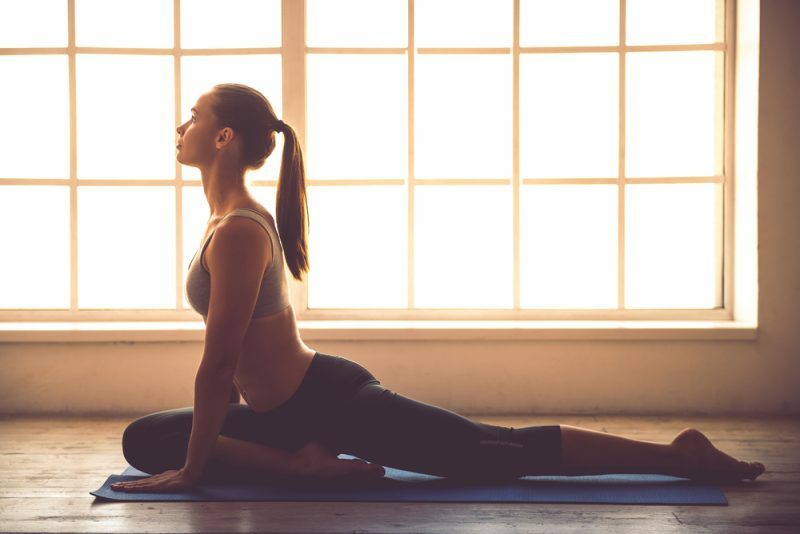 Every time you practice yoga you increase the flow of your spinal fluids and strengthen the muscles surrounding your spine; this has been scientifically proven to prevent or greatly reduce pain from back injuries. In terms of posture, consistency is key. If you want to create lasting changes in your posture, you have to commit to practicing yoga every day so that your body adapts to a new way of sitting, standing, and moving. While you can go days without food or water, no one can survive more than a few minutes without breath. Breath is literally life! Practicing yoga every days means reconnecting with your breath every day. Have you ever caught yourself breathing shallow through the day? Many people do not consciously breathe, but daily yoga can help that tremendously. The more often you breathe deep, full breaths, the better your circulation and brain health will be. This translates to all kinds of benefits, such as better immunity and decreased toxins in the body. Practicing different pranayama techniques every day can also help you alkalize your body and increase your lung capacity, which means you will be healthier and be able to breath deeper even when you’re not on the mat! Whether you’re concerned about getting older or enjoy having an active lifestyle, balance is key when preventing injuries. Practicing yoga every day can help strengthen little muscles in your hands, wrists, feet, and those surrounding your joints. This leads to greater balance and resiliency in the body, and also improves your ability to focus. If you’ve ever practiced a simple balancing posture like Tree Pose or Half Moon Pose you likely know – the moment you start thinking about your grocery list or work deliverables you will fall over! With a daily emphasis on balancing poses, you’ll notice how much easier it will be to flow into the pose and experience the sense of serene that comes from combining strength and attention. No matter how much yoga you do, it can be challenging to live in the modern world. With so much sensory input and interaction at work and with family, it’s easy to get caught up in the daily dramas we present for one another. However, a daily yoga practice does offer reprieve and a quick escape route out. As stated by famous yoga teacher B.K.S. Iyengar, “Yoga is a light which once lit will never dim, the better your practice the brighter your flame.” Sometimes the benefits of yoga are not huge and miraculous, but very small – just having a few quite moments of peace can dramatically improve your quality of life. While many people are tempted to end their night with a cocktail, they just might be better off doing a few yoga poses instead. According to the Harvard Health Blog, a national survey found 55% of people got a better night’s sleep on days when they did yoga. If you’re practicing yoga to wind down and de-stress at night, consider more cooling poses rather than invigorating ones. You might enjoy using more props for a restorative yoga session that focus’ on relaxing rather than deep stretching. Some suggested poses are Legs Up The Wall and Reclined Bound Angle Pose. Don’t listen to those who say doing yoga won’t help you lose weight! Yoga is one of the best ways to lose weight as it addresses your body holistically. And don’t think you have to slave away in a sweat-inducing Vinyasa yoga class either (although, if you like that kind of yoga, go for it!). Recent studies have found that people who practice gentle yoga experience greater weight loss when they combine the practice with regular, simple exercise and diet. The studies looked at two groups of people on the exact same diet and exercise regiment, and one group did gentle yoga while the other did not. The group that did the yoga dropped more weight and loss significantly more inches around their midsection due to the decrease of cortisol in their body. As you practice yoga daily, you might notice how much more in touch you become with the natural curves of your spine and body. Most yoga teachers and guidebooks provide in-depth descriptions of your body’s anatomy as a way to help you with your alignment in your poses. As you become more familiar with your alignment in the poses, the anatomy knowledge will really come second nature. Before long, you might just find yourself correcting your alignment while standing in line at the grocery store!